*Autonomy – Do you control a majority of your time at work and what you’re working on? *Mastery – Are you doing something you can get better at? *Purpose – Do you feel like you’re a part of something larger than yourself? These have been guide posts for me for the last three years since I first saw Mr. Pink spell out what I’d long suspected. My quarterly bonus of thousands of dollars as a Regional Manager wasn’t nearly as motivating to me as was the joy of helping one of my Managers succeed, or creating some new metric/model/marketing platform that would help propel our success. Sure, I love money, but I love my team and the thrill of winning a lot more. Especially when I get to create and collaborate in order to get there. Give this a view and really check your current motivations for why you do what you do. Are you propelled by your bonus potential, or possessed by your passion? If You Build It: Leasing Through Better Meals? One of the most interesting things about CVI-Orlando (Collegiate Village Inn) is that we have a dining hall and meal plans. NO ONE in off-campus student housing markets have these things – and for good reason. The cost to build a commercial kitchen and dining hall are staggering and the space they consume could be used for rentable units. Nowadays if you want a meal plan you outsource the operation to a 3rd party meal plan company of which there are many. Fortunately for us, CVI was built 20 years ago when UCF had virtually no on-campus housing and the surrounding area in general was sparsely populated/built up. Originally, CVI housed mainly football players and other athletes and with food costs being what they were, it obviously made financial sense to serve meals in-house. Does it still make sense? What are the margins? 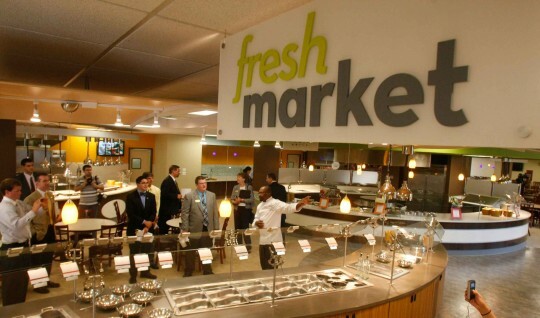 Can a café’/meal plan serving 400+ students daily be profitable? Apologies, but you’ll need some rough numbers to get this next part of the challenge. I know, stats are a killer for these blogs but they’re absolutely required. I promise to be gentle. Any idea what the redemption rate is on meals? That’s the number of meals we actually serve each week compared with how many we’re responsible to provide under these terms. Go ahead and guess a percentage. I’ll tell you a little later. The largest initial challenge regarding the café’ was figuring out what being successful there meant. I mean, serve great food and have an amazing experience and more meals get eaten. More meals consumed means greater cost, means less profit. Also, the number one factor in people choosing us is the meal plan so if you skimp on quality and cut costs you kill your number one area for adding value. You can see the dichotomy rearing it’s 9 hydra-like heads with its hankering for filet mignon and strawberry blintzes, can’t you? Before we could do much of anything we had to establish how many meals we were responsible for and how many were being consumed. What were our costs per meal? Believe it or not we had only estimates. Sure, people “signed in” to redeem their meals but the numbers were never compiled as there were around 3000 meals served weekly and who had time to count up all those hash marks? We made a new excel spreadsheet which pulled directly from our day-to-day occupancy report which also reflected the current meal plan option. This gets updated weekly and the host stand uses this to verify the number of meals consumed for each Student. At the end of the week we click the hash marks into the electronic version and it auto tabulates the meals consumed by day/meal/plan type, and gives us our redemption rate. After two months of solid data it turns out it’s about 45%. So if we’re on the hook for, say 5000 meals in a week, we’ll likely only serve 2250. That’s about 321 per day, or closer to 370 M-F and 200 on Sat/Sundays. It’s my belief that the best way to succeed at anything is to start with a picture of what the best possible way to succeed would look like. If Donald Trump and Bobby Flay teamed up to do a venture that looked like this place, what would they do? What would the food look like? What does the right mix of; delicious, cost effective, fast, nutritious, visually appealing, and convenient dining, look like? How do you brand an in-house cafeteria and make it more than a school lunchroom without dropping a quarter million in the process? Would Bobby Flay have the same thoughts about our chicken? We knew that listening to Resident feedback was a huge part of this endeavor. People (especially our female students) wanted healthier options, and more accurately – more visual appeal from our healthy options. We had to focus on being less utilitarian and more customer-centric. We could do this. We could also do it for less money if we were smart. Fewer burgers and more to-go mandarin orange-sesame salads. Out with “café” as the generic name – we were now “Bistro 106.” Complete with a new logo. BTW, the “106” comes from CVI being 106 in roman numerals – clever, right? I wish I could take credit but alas I cannot. We eliminated deserts as we couldn’t do them well and they were going uneaten. In their place was a ton more fresh fruit – strawberries, melons, pineapple. We began Mongolian Grill nights on Wednesdays with presentation tables while we show classic Kung-Fu movies on a big screen. These became a huge hit. We closely paid attention to waste and reduced it through observing eating trends and predicting with great accuracy how many meals we’d go through on a given day. Not all decisions were popular and we’re always working out the kinks. People miss their deserts so we do them a couple of nights a week now and in exchange for checking in on Foursquare to help promote the “Bistro 106” brand. It may not be every night, but it is of a much higher quality and we’re proud of that fact. One of our team members lamented the loss of pepper-jack cheese. Many still wish we had more vegetarian/vegan options. We’re still figuring out exactly what we are in terms of a fast-casual dining experience and we’re hoping our latest innovation will help. We want your feedback so badly we'll even embrace Twitter! Starting this week we’re rolling out “Eat & Tweet” where through table-tents we’re encouraging Residents to give us real-time feedback on the food/experience through sending a message to @bistro106 or #bistro106. Those that do will automatically be entered to win a weekly prize valued at around $25. We’re fanatical about feedback and want to know the whole story so we can be our best. In future posts I’ll fill you in on some of the specific changes we’re making to food/purchasing/processing, etc… and what mix and metrics we settle on as our ideal benchmarks. If you’re in the neighborhood (University and Alafaya in Orlando) come see us and have a meal at Bistro 106 on me!